You can also access the past issues using the "View Past Issues Button" in the upper left corner of the screen. Download the free BIM & Revit tools (listed below) from the Autodesk "Owners" website. While the Bradley BIM Team was building its 1000 Revit Family Library, Bradley surveyed and tested Bradley Revit models with architects, engineers, contractors, owners and their respective associations. Bradley emphasized both efficient Revit modeling techniques and embedding data (Revit parameters) into the models. 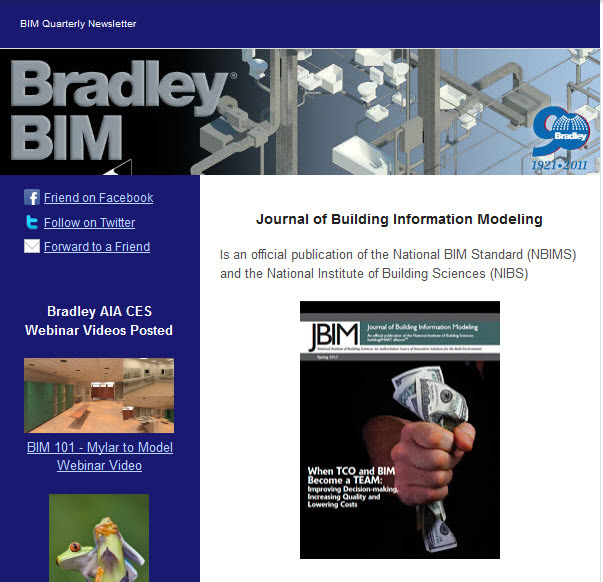 We documented these processes in the Bradley BIM FAQs Page. The original Bradley Revit Parameters were built for scheduling, extraction and tagging. Bradley realized the embedded data (parameter values, types & formatting) would undergo regular manipulation. 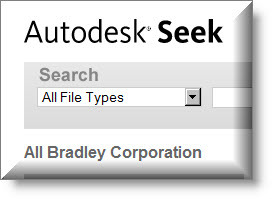 Now, Revit BIM data has become the focus of Bradley's 1000 free, pre-built Revit family components. This Revit plug-in facilitates the creation, placement, and validation of medical equipment within a BIM model from the DOD’s Space and Equipment Planning System (SEPS). This Toolkit includes a Revit template that allows users to create COBie spreadsheets in conjunction with Revit model development. Download from site. This Revit template helps users meet the USAF Flight Plan requirements for exporting S-File data. Download from site. This template assists Revit users in classifying rooms and areas in accordance with the GSA Space Assignment Guide specifications. Download from site.